Taking the theory of the x factor or that it quality, the V-Factor darts are made up of 90% Tungsten with 150 micron thick flights and Polycarbonate (plastic) short opal or tapered nylon shafts. V is for valiant, voracious and victorious. 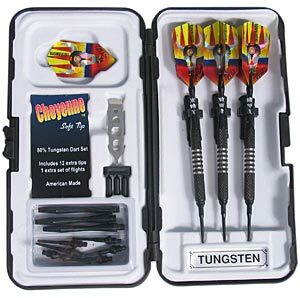 All this and more with these most unique and extraordinary darts. Flights, Case, and shafts may vary.